Need to dress up an outfit, attract attention, warn people of your presence or light up a party? Then the multi functional neon effects of EL wire could be for you. Whatever your reason, you’re sure to be seen with EL glow wire. EL glow wire or electroluminescent wire is a portable light source that works from two standard AA batteries to provide a bright, colourful glow that looks just like neon. Each wire is connected to a ready made portable battery pack that’s small and discreet enough to fit into your pocket. 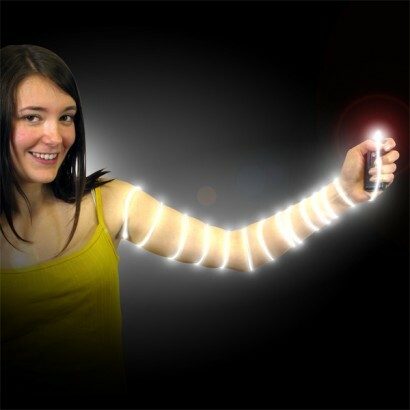 Use EL glow wire to light up outfits for an evening out, fancy dress costumes, or for charity fun runs. Apply it to door frames, to edge key features or for parties. Take it camping and funk up your tent or caravan. 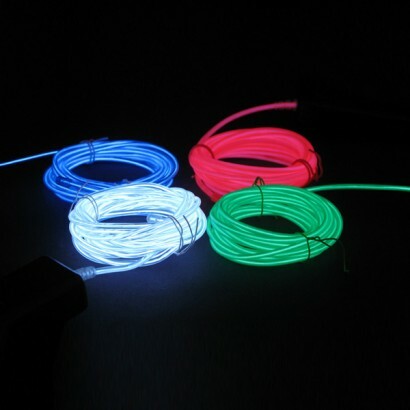 Multi use EL glow wire can also be used for health and safety; dress up your bicycle, or wear it on your person when you’re running or cycling in low light. Notes: EL Glow wire is very flexible but should is not effective when tied in knots or when subject to repetitive stress in the same area. Pink EL glow wire uses a coloured plastic sleeve to enhance the colour of the glow. In daylight when the wire is turned off it appears orange, but don’t worry, the glow is a rose pink colour. Bought this to put round the top of the bar i built for my fiance for christmas, being short of money this year, i've had to make do and give the gift of beer! The wire looks awesome round the rim and has gained some pretty good pats on the back (being blonde this is a good thing) Am just about to send the link for this item to my son in law who is now looking to use in his kitchen. Much brighter than expected and noisier than expected bu already installed in my porch for Halloween and looks good. I might get a few more. purchased this after buying a cheap version on amazon. this one was is far, far better and worked a treat on Halloween. well worth it !